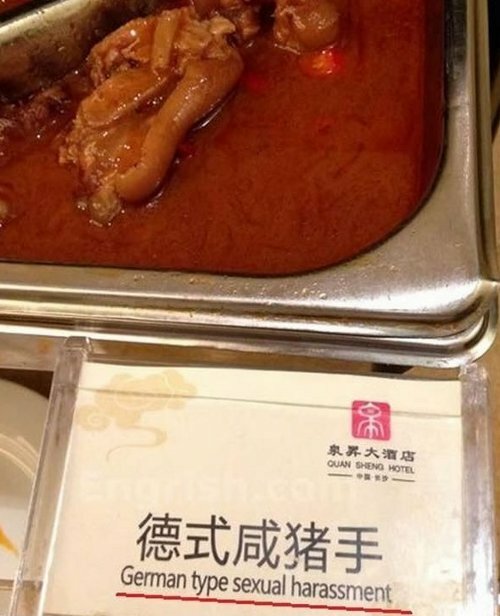 Language Log » "German type sexual harassment"
The Chinese says Dé shì xiánzhūshǒu 德式咸猪手 (German style "salted pig's knuckle / trotter"; cf. Schweinshaxe; Stelze in Austria). Xiánzhūshǒu 咸猪手 also has the derived meaning "groper", which is also often rendered as "sexual harassment". I have explained all of this at great length and with considerable detail in "Grilled sexual harassment"(5/5/13). So it neatly encompasses more that one meaning of 'pig'? There is a rich supply of similar gems on engrish.com, including this one. I beg forgiveness on behalf of myself and every other reader who couldn't help themselves from momentarily imagining stern, polite, humorless, punctual sexual harassment. I know better. Is that meant to be a slur? Goodness no, merely a confession that tired Germanic stereotypes pop into my head unbidden when I read something like "German type sexual harassment" — contrary to everything I know about actual Germans. Apologies to anyone who did see it as a slur. A buffet restaurant in a fancy hotel I recently visited in Quzhou featured bilingual cards like this for the dishes, a number of which had strange translations. The one that amused me the most: Sliced side pork in black bean sauce, clearly labeled "Kevin Bacon."